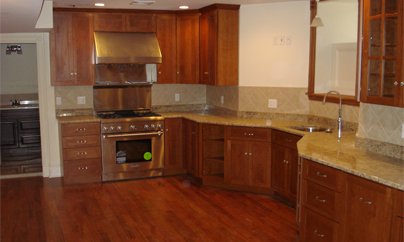 Home - Hurley-Testa Construction Co., Inc.
We provide complete turn-key kitchen remodeling from the early planning stages to removal of the existing kitchen and all the way to the completed kitchen with functioning appliances. We also update portions of kitchens such as installing additional cabinets, new counter-tops, new flooring (tiled or wood), new lighting and trim work. 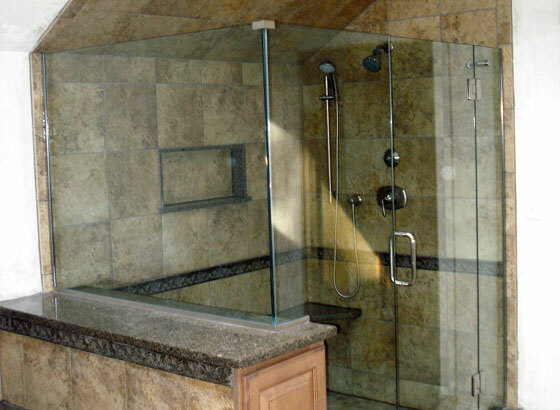 We provide complete turn-key bathroom remodeling. We will assist you in creating the bathroom plan (if needed), selecting plumbing and electrical fixtures, tile and solid surfaces (vanity tops). We have provided unique solutions to make bathrooms larger and sometimes appear larger. 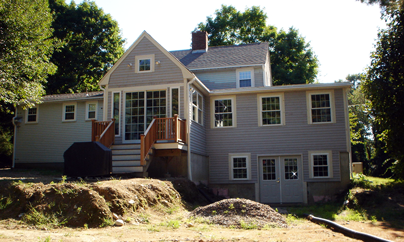 We have extensive experience with building additions of all types and sizes including family rooms, kitchens, garages, master bedroom suites to “dog house” additions to replace bulkheads for easier access to basements. We will guide you through the planning phase, develop computer generated 3-D layouts, create detailed drawings and build your addition. Want to create additional living space cost effectively? We can help you stay with in the confines of the existing house and foundation. HTCC has created large master bathrooms and closets in unused second floor eaves. 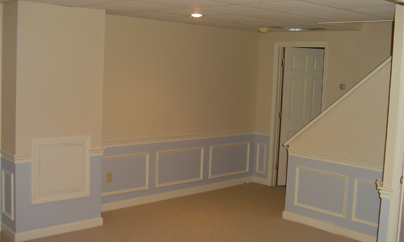 We have renovated basements to create large areas of open space or rooms for specific uses such as game rooms, home entertainment rooms, offices, play rooms, hobby rooms, exercise rooms and laundry rooms. Let us assist you in the planning and design phase as well as the build-out. Don’t want to move, live in a ranch or cape and need more space for bedrooms? A second story added to your house will provide additional bedrooms and open up more space on the first floor for a larger kitchen, office, bathroom or family room. We will guide you through the planning phase, develop computer generated 3-D layouts, create detailed drawings and build to your specifications. Do you want to spend more time outdoors? We can make that happen with a new deck or porch. Today’s technologies have created materials that require little to no maintenance (i.e. 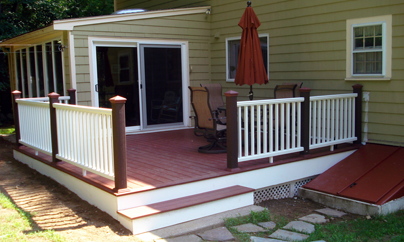 staining, painting) and are moisture and pest resistant making them ideal for decks and porches. Let us design your new deck or porch and then build it for your enjoyment. Purchased or thinking of purchasing a new home or tired of your current home that needs to be remodeled? We can help. We have extensive experience in completely gutting houses, moving walls and locating support structures to create a new look and feel for the home. 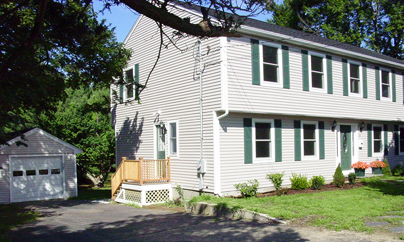 We also rehab rental and investment properties for quick sales or rentals. Want to add some crown moulding at your ceilings, install hardwood flooring, create customized built-ins, wainscoting, add new windows where none exist or enlarge existing ones, create unique office or laundry spaces, replace your stairs or stair railings, trim out your fireplace with a new mantel and surround? We have provided these solutions plus many more over the years. 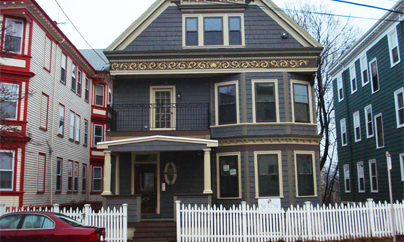 Hurley-Testa Construction Co. Inc. (HTCCI) specializes in all facets of residential remodeling and home repairs. The principals, Greg and Tim, have over 50 years of combined experience. 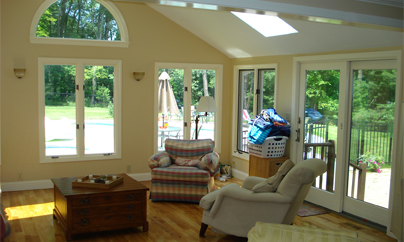 HTCCI provides the complete solution to your remodeling needs. We have our own subcontractors (i.e. Plumbing, HVAC, Electrical, Plastering and Painting) that we use on each job. There is no need to seek your own subcontractors, unless you desire to. HTCCI employees perform all carpentry including framing and finish work as well as tiling and hardwood flooring installation. HTCCI has provided unique and cost effective design solutions to difficult jobs by drawing on the expertise of our principals as well as our designers and subcontractors. The Lowell Mason House Holiday Concert at the First Baptist Church @7:30pm. This is a great fundraiser for a well deserved project in town. We are members or certified with the following associations.